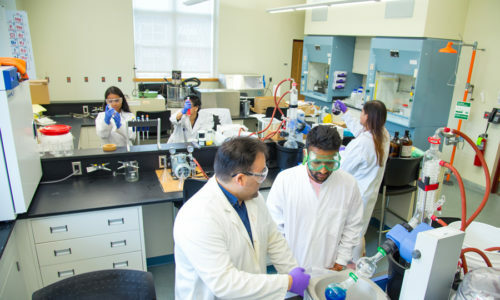 Riverdale, N.Y. – The College of Mount Saint Vincent has received a $959,955 grant from the National Science Foundation’s (NSF) Scholarships in Science, Technology, Engineering, and Mathematics (S-STEM) program to promote achievement across STEM fields and provide financial assistance for four years to exemplary students in the Division of Natural Sciences. The NSF funding will provide scholarships to 22 high-achieving, low-income students and will support the Mount’s Scholars-on-Track II program—a program that expands diversity in the STEM workforce by recruiting students with strong academic potential from underrepresented and underserved populations, while promoting improved academic performance, retention, degree completion, and post-baccalaureate opportunities for participants. Activities offered through the program have been shaped by models that have proven to be effective for all students, but particularly so for students from minority and underserved populations, both of whom comprise a significant portion of the College’s student population. To support student engagement and success, the College will offer students an array of career development and enrichment activities, such as conducting scientific research with faculty, presenting at national conferences, attending workshops and career panels, and visiting museums and academic centers. Scholarship recipients will also receive a summer stipend, guaranteeing additional research opportunities, internships, and the ability to explore careers in all disciplines of the scientific enterprise. The program is under the direction of Principal Investigator Pamela Kerrigan and Co-Principal Investigators Ana Ribeiro and Erika Gillette, Chair and Instructor of Teacher Education. This is Mount Saint Vincent’s second S-STEM grant, having received NSF funding from 2012-2017.